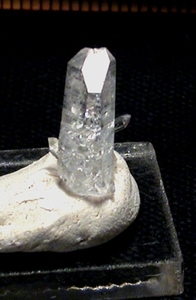 Power-packed crystal clear Arkansas laser belies its 7/8x 3/4" tall size. Multiply-penetrated doing a wave, its clarity brings its vibrant rainbows into full color for you. A dimpled back facet is in twinning regrowth, as is its base. A 1/2" doubly-terminated crystal kisses tips with another at their host's back.